Women on a Mission: Mom Edition: BASEBOARD SCRATCH COVER--AMAZING! Most of my baseboards in my house are white. I love white trim, white paint, white kitchens...I LOVE WHITE! However, my 1930's house came with some very beautiful trim in the living room and dining room that has yet to be touched with paint, and I do not want to cover it up! Some of the baseboards had scratches, scrapes, and were looking a little beat-up. Honestly, the entire process was simple. 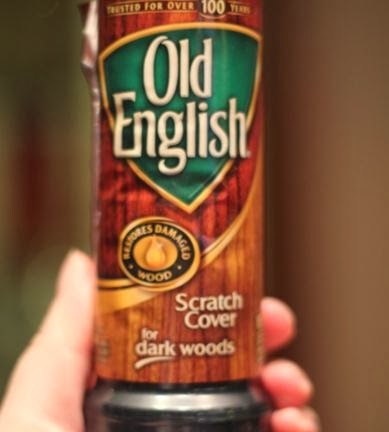 I decided to use Old English Scratch Cover for dark woods. Using a clean cloth, I rubbed it on. Using another clean cloth, I wiped off the excess Old English. I can't believe how great it looks! My baseboards look like brand-new! The entire process was super affordable. I just wish I did this sooner! Hey that's brilliant! Very helpful. Thanks for sharing these tips. Thank you so much Kailyn! So much easier than replacing or sanding! And, it still looks GREAT!